South End Supporters in section 113 part of the U-Sector wave their flags high in the air ahead of the 2017 MLS Cup Final. Image by Dennis Marciniak of denMAR Media. Toronto FC with Don Garber in the foreground as fireworks go off in the background during the opening ceremonies for the 2017 MLS Cup Final. Image by Dennis Marciniak of denMAR Media. 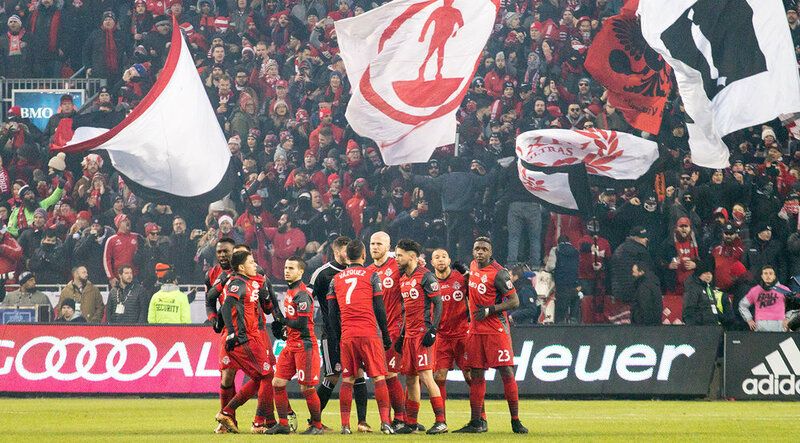 Toronto FC's starting XI breaking away seconds away from kickoff during the 2017 MLS Cup playoffs against Seattle. Image by Dennis Marciniak of denMAR Media. 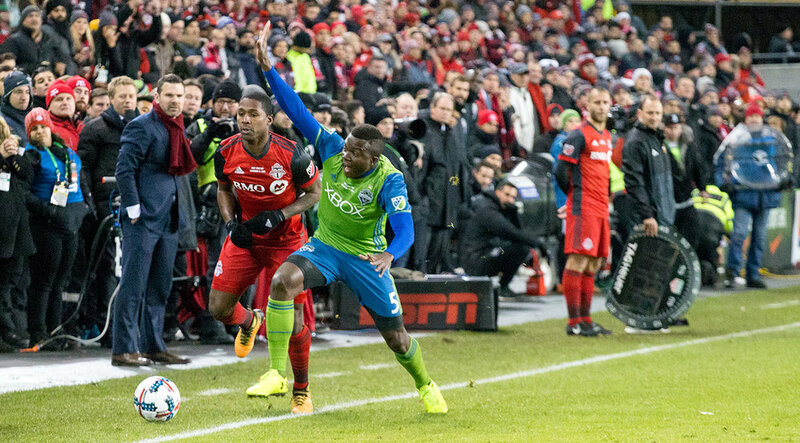 Sebastian Giovinco tries to find space with Roman Torres trying to shut down the play during the 2017 MLS Cup Final. Image by Dennis Marciniak of denMAR Media. Sebastian Giovinco taken down to ground during the 2017 MLS Cup Playoffs. Image by Dennis Marciniak of denMAR Media. TFC's Justin Morrow breaks into the 18 yard box during the 2017 MLS Cup Playoffs. Image by Dennis Marciniak of denMAR Media. 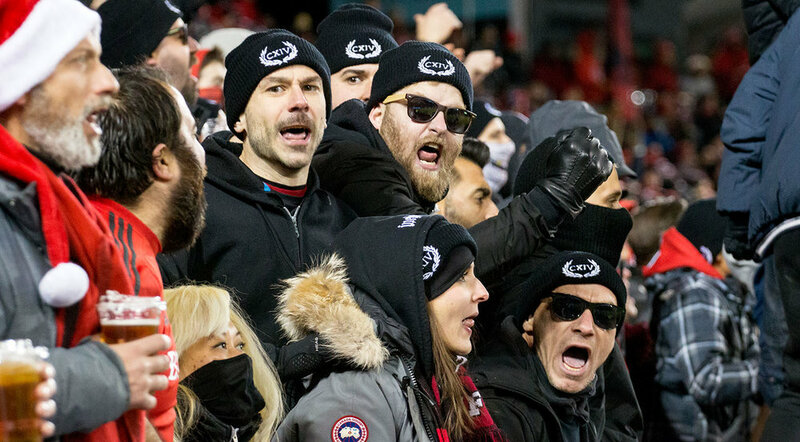 Red Patch Boys in the south end wave their flag during the MLS Cup 2017 playoffs. Image by Dennis Marciniak of denMAR Media. 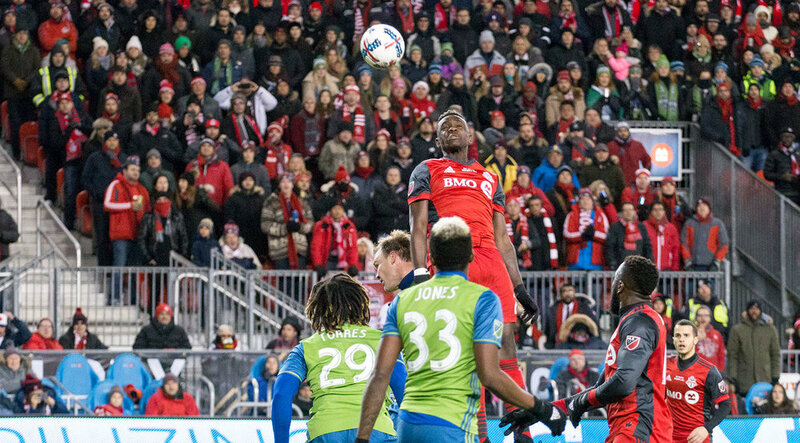 Chris Mavinga goes into the air in the Seattle 18 yard box against the Seattle Sounders during the 2017 MLS Cup Final at BMO FIeld. Image by Dennis Marciniak of denMAR Media. Jozy Altidore looks to take a shot on goal while a Seattle Sounders defender attempts to put a stop to that. Image by Dennis Marciniak of denMAR Media. 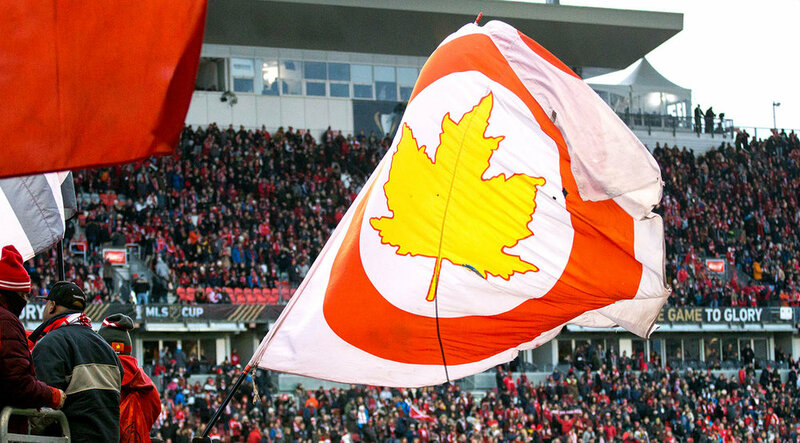 A beer thrown onto the pitch at BMO Field during the Major League Soccer Cup Final. Image by Dennis Marciniak of denMAR Media. Stefan Frei (former Toronto FC goalkeeper) watching the ball clear his box after a save during the 2017 Major League Soccer Cup Final at BMO Field. Image by Dennis Marciniak of denMAR Media. Media from various North American media outlets fill the south end to cover the 2017 MLS Cup Final. Image by Dennis Marciniak of denMAR Media. Victor Vazquez looking to get the ball into the 18 yard box during the 2017 MLS Cup Final. Image by Dennis Marciniak of denMAR Media. Sebastian Giovinco heads to to take a corner kick at BMO FIeld during the 2017 Major League Soccer Cup Final at BMO FIeld on Decemeber 9, 2017. Image by Dennis Marciniak of denMAR Media. Sebastian Giovinco trying to get around a Seattle Sounder defender at BMO FIeld. Image by Dennis Marciniak of denMAR Media. My favourite Inebriatti supporters making the noise they've been making all year during the 2017 MLS Cup FInal. Hats off to you guys. Image by Dennis Marciniak of denMAR Media. Sebastian GIovinco and Seattle Sounders' Roman Torres get into it during the second half of the MLS Cup Final on December 9, 2017. Image by Dennis Marciniak of denMAR Media. Jozy Altidore celebrating moments after the ball rolls across the goal line during the MLS Cup Final in 2017. Image by Dennis Marciniak of denMAR Media. South End Supporter Groups light smoke up in celebration of the Jozy Altidore goal during the 2017 MLS Cup Playoffs at BMO Field in Toronto, Canada. Image by Dennis Marciniak of denMAR Media. 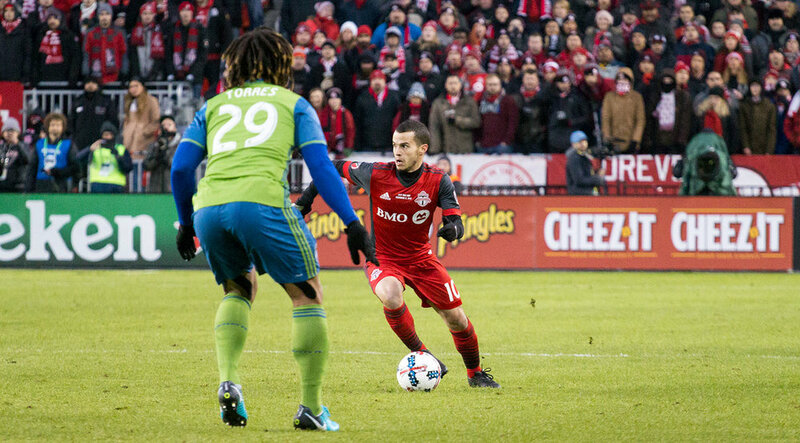 Sebastian Giovinco tries to get past another Seattle Sounder defender at BMO FIeld in 2017. Image by Dennis Marciniak of denMAR Media. Fans in the east stands doing the thunder clap during the 2017 MLS Cup final. Image by Dennis Marciniak of denMAR Media. Justin Morrow takes flight during the 2017 MLS Cup Final to get a header to the ball at BMO FIeld. Image by Dennis Marciniak of denMAR Media. Stefan Frei takes a sip of water as it trickles through his beard during the 2017 MLS Cup playoffs at BMO Field. Image by Dennis Marciniak of denMAR Media. Marky Delgado awaits the landing of the ball in the attacking end during the MLS Cup playoffs in 2017. Image by Dennis Marciniak of denMAR Media. Stefan Frei helps out Sebastian Giovinco after cramping up on the ground in the attacking 18 yard box. Image by Dennis Marciniak of denMAR Media. 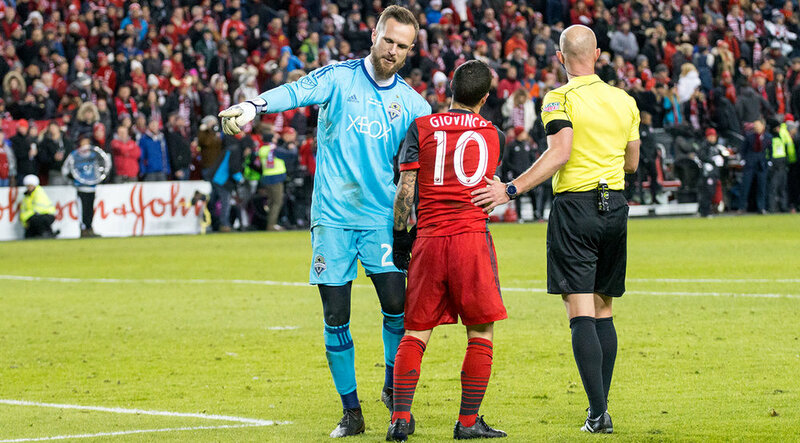 Stefan Frei now tries to convince Sebastian Giovinco to take it to the end line in hopes of playing with 10 men for a few minutes. Image by Dennis Marciniak of denMAR Media. 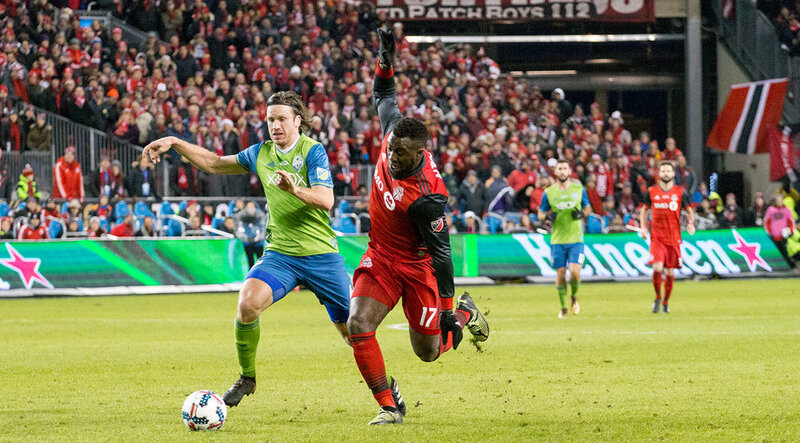 Greg Vanney looks on as Toronto FC and Seattle Sounders players battle for the ball near the coaching area. Image by Dennis Marciniak of denMAR Media. Smoke fills BMO Field from the south end supporters' section as the second insurance goal is scored. Image by Dennis Marciniak of denMAR Media. 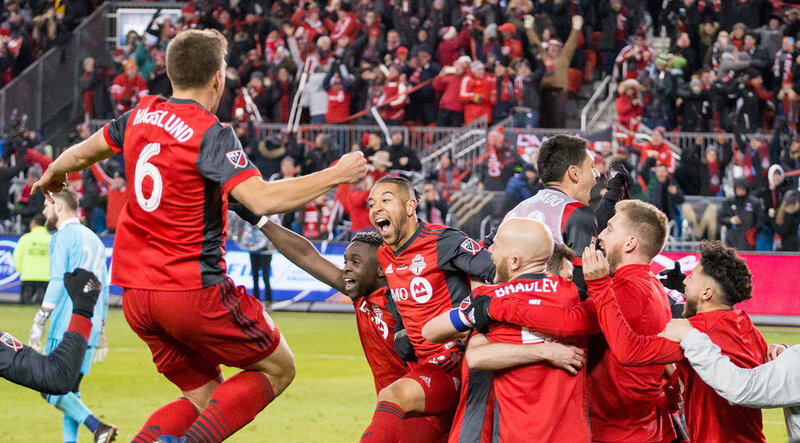 Toronto FC celebrating moments after the second goal is scored for Toronto FC solidying the 2017 MLS Cup victory for the team. Image by Dennis Marciniak of denMAR Media. Flares light up the south end supporter's section after the second goal is scored during the MLS Cup at BMO FIeld. Image by Dennis Marciniak of denMAR Media. Michael Bradley, Don Garber and Taylor Twellman await the trophy presentation after the 2017 MLS Cup final whistle is blown. Image by Dennis Marciniak of denMAR Media. Michael Bradley taking the 2017 MLS Cup to the stage awaited by an excited Toronto FC. Image by Dennis Marciniak of denMAR Media. Michael Bradley about to lift the 2017 MLS Cup trophy at BMO Field after winning 2-0. Image by Dennis Marciniak of denMAR Media. Sparks fly as the MLS Cup is finally lifted at BMO Field in 2017 after 11 seasons. Image by Dennis Marciniak of denMAR Media. Confetti and smoke fills the stadium as Michael Bradley celebrates with Toronto FC to take home the 2017 MLS Cup. Image by Dennis Marciniak of denMAR Media. Michael Bradley elated over the 2017 MLS Cup win. It's been four years in the making for Michael. Image by Dennis Marciniak of denMAR Media. Toronto FC celebrates the treble with the south end supporter's section with a thunder clap. Image by Dennis Marciniak of denMAR Media. 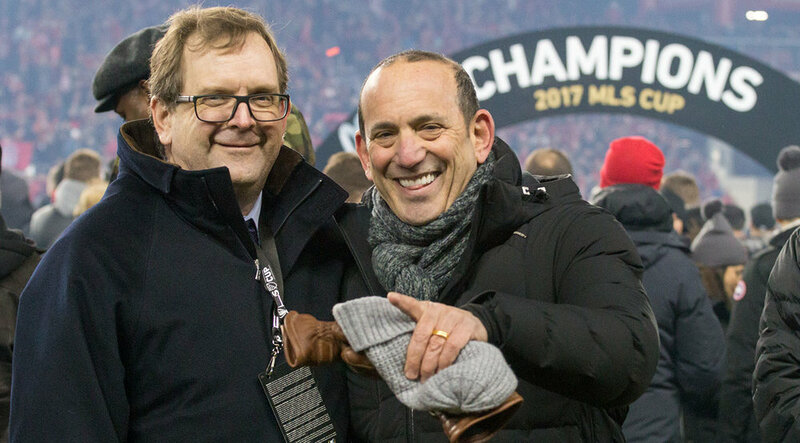 Don Garber is all smiles after Toronto FC takes home the MLS Cup after 11 seasons. Image by Dennis Marciniak of denMAR Media. Chris Mavinga lets some young supporters touch the MLS cup as he brings the trophy the east end. Image by Dennis Marciniak of denMAR Media. Sebastian Giovinco spraying Michael Bradley with champagne in the locker room after taking home the 2017 Major League Soccer Cup. Image by Dennis Marciniak of denMAR Media. Drew Moor celebrates in the locker room as beer and champagne get sprayed everywhere during the MLS Cup 2017 at BMO Field. Image by Dennis Marciniak of denMAR Media. The trophy is lifted in the south end to celebrate the win for Toronto FC's 2017 MLS Cup win. Image by Dennis Marciniak of denMAR Media.